Remember that every Saturday from 10am to 1pm the Taupo Riverside Market is open, directly across the Waikato river from the apartment. Crafts, locally produced foods and preserves, great coffee and juices are just a few of the things that will tempt your tastebuds. It's also a great place to find a souvenir of your trip to Taupo. Please remember to book your Taupo accommodation early to avoid disappointment. Many of the events listed below are extremely popular and you need to be in quick to book our sought-after apartment on the river. Held over five days, the playing format and more information can be read on the NZMGA website. Registration opens at 8am on Sunday 6 January. New Zealand's finest and aspiring distance swimmers meet every year in the fresh-water playground of Lake Taupo for the Epic Swim. Starting with the short courses for the little ones (ages 5-10) the distances increase to the truly epic 17.5km course. Another stellar line-up of artists will headline at the Taupo Summer Concert during the long (anniversary) weekend in 2019. Roger Hodgson (Supertramp), the inimitable James Reyne (Australian Crawl) with Mark Seymour (Hunters and Collectors) and the unmistakable voice of Toni Childs will sound out over the amphitheatre and river. Soak up the atmosphere, get your tickets and most importantly - don't forget to book your Taupo accommodation. At the moment Riverside One is still available - and it's the flagship, so reserve three bedroom apartment while it's still available. Please remember that we ask for a five-night booking period as this falls over the summer holiday period. Grab some friends, stay five nights and have a fantastic time - even if you're not staying for the concert it's a remarkable time to be in Taupo. For more information about the 2019 Taupo Summer Concert check the Greenstone Entertainment site. Incredible off-shore power boating creating a truly amazing spectacle. Get out on the water or check out the action from Lake Terrace. For beginners to competitors, the Sovereign Tri Series is one of the biggest festivals of triathlon in New Zealand. In the height of summer, Kinloch hosts this great event with short-course 300m / 9km / 3km (swim / bike / run) races for individuals or teams up to the standard triathlon distances of 1500m / 40km / 10km for the teams or individual triathletes. Check it out at the Kinloch Triathlon website. The Kinloch Tri event normally falls on the second Sunday in February each year. The Great Lake Relay is regarded as the best team-building exercise of all time. Every year around 4,500 participants run and walk the 155 km course around Lake Taupo in teams of 10 to 18. The addition of the Nature Valley Length caters for teams of five to eight members and covers the 67.5 km from Pukawa on the south-western shore to Taupo township. Solo runners / walkers cover the same distance. Book early to reserve Riverside Apartment for your team. This event is normally held on the third Saturday in February of each year. Established in 1999 the Taupo New Zealand Ironman event is considered the world's most international with approximately half of the competitors coming from outside of NZ. 2019 celebrates its 35th year. Perhaps we are biased but we think it is also the most beautiful course of any Ironman too. Riverside Apartment is an ideal base for the Ironman as it has plenty of bedding for the athletes and their support teams and lots of space downstairs (double secure garage) for the bikes and equipment! Book early for Taupo's premiere sporting event - traditionally held on the first Saturday in March each year. The Taupo Home and Garden Show returns to the Great Lake Centre. Gather some great ideas and information to transform your house or garden. New innovations, seminars, expert advice, latest trends and products will be available under one roof from the many exhibitors. The inaugral event of 'Hooked' has been postponed and is 'likely' to be run again in April of 2020. The Hoka One One Tauhara Trail Run and Walk has been replaced by a new event, the Steamy Huka which includes marathon, half marathon, 10km and 5km run/walk distances. More information is available on the Steamy Huka website. The Hoka One One Marathon, Half Marathon, 10km and 5km event continues in 2019 in its 26th year, taking in amazing scenery as thousands of runners pound the pavement in this key event in Taupo. Book now. This event is normally held on the first Saturday in August each year. For more information check out the website. Off-road running at its best - from 5km to the full off-road marathon - choose your level of pain then ease back and relax once you've booked Riverside Apartment for your stay. More information at their website. This event is normally held on the first Saturday in September each year. Run the Great Lake Trail solo or as part of a group in this endurance event that has distance options of 24, 50, 74 and 100km. Book Riverside Apartment for your stay - there's room for the whole team (and supporters). More information at the Taupo Ultra Marathon website. The Taupo Ultra Marathon is normally scheduled for the second Saturday of October. New Zealand's largest bike event sees up to 10,000 riders from all around the world coming to take part over year. Rated as one of the six best recreational events in the world - read more about it. Don't forget the warm-up event - the action-packed Criterium street race around the town. Remember that our secure double garage is perfect for storing your valuable bikes as well as your support wagon! 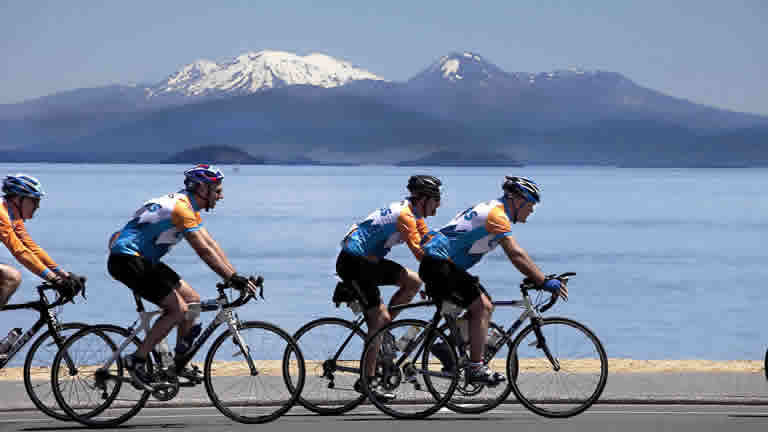 The Lake Taupo Cycle Challenge is held every year on the last Sunday in November. 1.9 km swim, 90 km bike, 21.1 km run. If only it was as easy as booking your stay. A festival of Triathlon events for those aged under 21 (in three age groups) centered around Taupo. Over three days, events held at Bruce McLaren Motorsport Park, Lake Terrace and Wharewaka. More information available at the future champioNZ website. Please visit www.GreatLakeTaupo.com/Events for the full list of events in the Great Lake Taupo region. New Zealand's finest and aspiring distance swimmers meet every year in the fresh-water playground of Lake Taupo for the Epic Swim. Starting with the short courses for the little ones (ages 5-10) the distances increase to the truly epic 17.5km course. 2020 also sees the return of the 4 x 1km team relay event - grab four of your swimming friends and book our apartment - they both sleep up to six and our location is perfect, walking distance from the lakefront. Another stellar line-up of artists will headline at the Taupo Summer Concert during the long (anniversary) weekend in 2020. Greenstone Entertainment will let us know the final line-up in the first few months of the year, so get ready to soak up the atmosphere, get your tickets and most importantly - don't forget to book your Taupo accommodation. 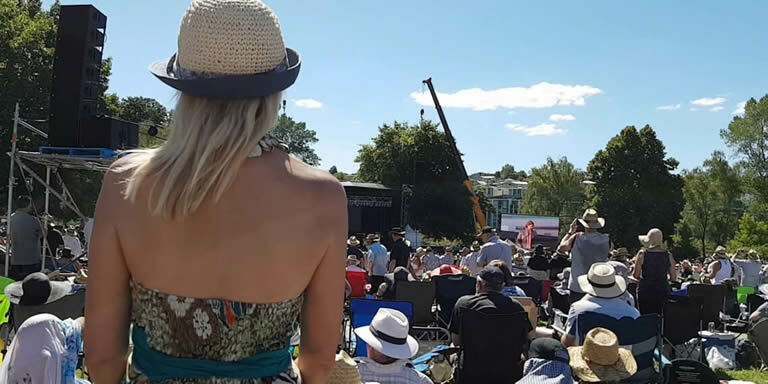 For more information about the 2019 Taupo Summer Concert check the Greenstone Entertainment site. The Hoka One One Marathon, Half Marathon, 10km and 5km event continues in 2020 in its 27th year, taking in amazing scenery as thousands of runners pound the pavement in this key event in Taupo. Book now. This event is normally held on the first Saturday in August each year. For more information check out the website. Off-road running at its best - from 5km to the full off-road marathon - choose your level of pain then ease back and relax once you've booked Riverside Apartment for your stay. More information at their website. This event is normally held on the first Saturday in September. New Zealand's largest bike event sees up to 10,000 riders from all around the world coming to take part over year. Rated as one of the six best recreational events in the world - read more about it. Don't forget the warm-up event - the action-packed Criterium street race around the town. Remember that our secure double garage is perfect for storing your valuable bikes as well as your support wagon! The Lake Taupo Cycle Challenge is held every year on the last Sunday in November, though in 2020 the proposed dates are either 14 November or 6 December to de-conflict with the IronMan 70.3 World Championship. A major coup for Taupo, it has won the rights to hold the 2020 World 70.3 Championship. Events don't get much bigger than this, so get in early to book your stay. Minimum stay requirements apply. 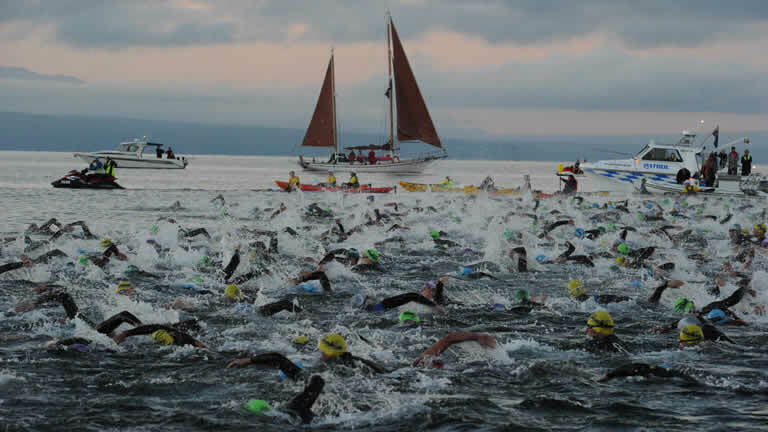 A festival of Triathlon events centered around Taupo. Over three days, events held at Acacia Bay, Lake Terrace, the Yacht Club and Wharewaka. More information available at the future champioNZ website.